Today, Finance Minister Arun Jately in a Facebook post described the note ban as a "key step in a chain of important decisions taken by the government to formalize the economy". It's been two years since Narendra Modi announced demonetisation with the objective to fight black money, corruption and terror funding. Today, Finance Minister Arun Jately in a Facebook post described the note ban as a "key step in a chain of important decisions taken by the government to formalize the economy". One of the key poll promises of Narendra Modi-led BJP in the 2014 Lok Sabha elections was bringing back the black money. Before he became Prime Minister, Modi vowed to bring all illicit money stashed away in foreign countries, and promised that poor people in the country would get Rs 15 lakh each. "I will bring back every rupee stored away in foreign banks and ensure it is used for the rehabilitation of the poor," said Modi. However, after the BJP came to power, Amit Shah in an interview in 2015 said: "Modi ji's statement was just a jumla. Everybody knows black money won't be deposited in bank accounts of people." Instead, it would be used to fund different government schemes for the poor, Shah clarified. A few months before the country goes to polls again, it's time to find out if the Modi government has kept its promise. Here are the numbers. Demonetisation has been largely considered a failure in curbing black money, but led to increased domestic MF investments and CASA deposits. Demonetisation of high-value currency notes -- Rs 500 and Rs 1,000 notes -- that constituted 86.4 per cent of the money in circulation in November 2016 was a step taken to bring back money that was out of the banking system. The government initially expected currency only worth Rs 10 lakh crore to be returned to banks. However, the government and the RBI faced criticism because most of the currency in circulation was recovered, and only 1.04 per cent was not returned. The total value of invalidated Rs 500 and Rs 1,000 notes at the time of demonetisation was Rs 15.44 lakh crore, out of which only Rs 16,000 crore was not returned to the RBI. As per the final numbers disclosed by the RBI in August 2018, Rs 15.31 lakh crore returned to the banking regulator which was far higher than the government expectation of recovering only Rs 10 lakh crore. In essence, demonetisation has not met the government's goal of wiping out black money from the Indian economy. The central bank spent Rs 21,000 crore in handling the mechanics of demonetisation, including printing of notes. This reduced RBI's profits which resulted in lesser dividend being paid to the cenral government. Pre-DeMo, RBI transferred a dividend of Rs 65,876 crore to the government in 2015-16. Post-DeMo, RBI's dividend declined by more than half. In 2016-17 RBI paid a dividend of Rs 30,659 crore. It went up again in 2017-18 but did not touch the mark of 2015-16. The RBI paid Rs 50,000 crore as dividend to the government earlier this year. However, demonitisation had some positive impact on the economy as well which reflected through increase in AUM (assets under management) of mutual fund industry. Sizeable expansion in the collections of debt/income-oriented mutual funds occurred after demonetisation i.e., during November 2016 to March 2017. The AUM by mutual funds increased from about Rs 16 lakh crore to Rs 21 lakh crore between end-October 2016 and end-October 2017. AUM today stands at 24.31 lakh crore, as per AMFI data. As per RBI, seven specific accounts, namely Basic Saving Bank Deposit Accounts, PMJDY Accounts, KCC, dormant or inoperative accounts, co-operative banks' accounts with scheduled commercial banks, bullion trader/jewellers' accounts, and loan accounts, witnessed a steep rise in deposits. The total cash deposits in these seven types of accounts during November-December 2016 with 52 banks were estimated at Rs 4.35 lakh crore. Cash deposits in these accounts during September-October 2016 were Rs 2.70 lakh crore. The difference of Rs 1.65 lakh crore is increase in cash deposits under these accounts due to demonetisation. The estimated cash deposits in such accounts with 52 banks amounted to Rs 3.06 lakh crore during November-December 2015. This is further strengthened by the trend growth rate of last five years which displayed a negative growth of 9.2 per cent in net deposits during November-December. RBI report says that detection of fake Rs 500 and Rs 1,000 notes decreased by 59.7 and 59.6 per cent respectively after demonetisation. The RBI says, "Compared to the previous year, there was an increase of 35 per cent in counterfeit notes detected in the denomination of Rs 100, while there was a noticeable increase of 154.3 per cent in counterfeit notes detected in the denomination of Rs 50." In total, Rs 69,350 core was recovered under Income Declaration Scheme and Black Money and Imposition of Tax Act, and another Rs 5,000 crore under PMGKY. In 2015, the Narendra Modi government enacted Black Money (Undisclosed Foreign Income and Assets) and Imposition of Tax Act. The government provided a one-time window for compliance -- from July 1 to September 30 in 2015 -- to those who had undisclosed foreign assets. Around 650 people declared deposits worth Rs 4,100 crore deposited in foreign banks. Thereafter, two more compliance windows were provided by the government - first, under the Income Declaration Scheme (IDS) in 2016. Under this scheme, anyone who had not disclosed their income or assets honestly in the previous assessment year got a chance to disclose it. In turn, they would have to pay a tax of flat 45 per cent. The other option was the Pradhan Mantri Garib Kalyan Yojana (PMGKY) launched in December 2016, which provided an opportunity to declare unaccounted wealth and black money in a confidential manner and avoid prosecution after paying a fine of 50 per cent on the undisclosed income. It also offered an option of investing an additional 25 per cent of the undisclosed income in the scheme, which would be refunded after four years, without any interest. According to Finance Minister Arun Jaitley and Revenue Secretary Hasmukh Adhia, total 64,275 people disclosed Rs 65,250 crore under the IDS while assets worth Rs 5,000 crore were declared under the PMGKY. Provisional attachments made in transactions involving Benami properties valued more than Rs 4,300 crore. The Benami Transactions (Prohibition) Act of 1988 was amended in 2016 with the aim to clamp down on benami transactions. The amendment fast-tracks procedure in dealing with Benami properties and ensures stringent punishment for offenders. The Income Tax Department had set up 24 dedicated Benami Prohibition Units across India. According to Minister of State for Finance, Shiv Pratap Shukla: "As on June 30, 2018, provisional attachments have been made in more than 1,600 Benami transactions involving Benami properties valued at over Rs 4,300 crore." Double Taxation Avoidance Agreement (DTAA) allowed Indian government to prevent money laundering. Several foreign policy measures were also taken to keep a check on fraudulent transactions. Prominent among these were the implementation of the General Anti-Avoidance Rules (GAAR) that came into force on April 1, 2017. GAAR seeks to prevent companies from routing transactions through other countries to avoid taxes. The Double Taxation Avoidance Agreement (DTAA) with Mauritius was amended on May 10, 2016. The government could now levy a tax on the capital gains from sale or transfer of shares of an Indian company acquired by a Mauritian tax resident. It was an effective step towards blocking the Mauritius route of money laundering and black money generation. Swiss National Bank has agreed to share account details of Indians depositors with the Indian government from September 2019. On November 22, 2016, a pact was signed with the Swiss National Bank that would enable the government to receive information on Indian account holders in Swiss banks from September 2019 onwards. The information that could be exchanged under this framework would include account number, name, address, date of birth, tax identification number, interest, dividend, receipts from insurance policies, credit balance in accounts and proceeds from sale of financial assets. However, two following developments have raised suspicion as well as confusion over the amount of money Indians have stashed away in Swiss banks. First came the news that total liabilities of Swiss Banks towards Indians had increased 50 per cent in 2017 to 1.01 billion Swiss Francs vis a vis 2016. After this, data had surfaced quoting Swiss National Bank that non-bank loans and deposits by individuals and corporate in Swiss bank accounts have gone down by 35 per cent in 2017 compared to the previous year. Interim Finance Minister Piyush Goyal, who was filling in for Arun Jaitley then, had even claimed that since the Modi government came to power in 2014, the figure has dropped by 80 per cent. As a result, the non-bank deposits have declined from $800 million in 2016 to $524 million in 2017; these deposits were $2.23 billion in 2014. A fall in such deposits is good but the big question is if it's not going to Swiss banks, where is it going? Indians surely haven't stopped parking funds abroad just yet. As tax net widened, number of tax payers doubled while tax collection saw close to 50 per cent increase during the last four years. Due to the measures taken by the Modi government to boost tax compliance in the past four years, there has been a notable increase in the number of income tax payers and tax collection rate. In 2013-14, there were only 3.79 crore taxpayers in India, which increased to 4.07 crore in 2015-16 and 6.84 crore in 2017-18. The gross tax revenue has also seen an uptrend from Rs 12.44 lakh crore in 2014-15 to Rs 14.60 lakh crore in 2015-16 and Rs 17.15 lakh crore in 2016-17. The budget estimates for 2017-18 stood at Rs 19.11 lakh crore, and for the current year the budget estimate stood at Rs 22.71 lakh crore. Indirect tax collection till November 30, 2017 was at Rs 7.35 lakh crore as compared to full year target of Rs 9.27 lakh crore. In FY15, total indirect tax collection was Rs 5.46 lakh crore, which rose to Rs 7.11 lakh crore in FY16. In FY17 indirect tax collection stood at Rs 8.63 lakh crore, which was 22 per cent higher than the actual Revenue Receipts in FY 2015-16. Till November 30, 2017, Rs 7.35 lakh crore was collected as indirect tax by the government as compared to full year target of Rs 9.27 lakh crore. Since demonetisation, direct tax buoyancy has more than doubled from 0.6 times in FY16 to 1.3 times in FY17 and 1.7 times in FY18. Tax buoyancy is a measure of the responsiveness of tax receipts to economic growth and reflects an increase or decrease in government income. The direct tax buoyancy from FY08 to FY14 hovered around 0.5 and 1.1 times, while in FY15 and FY16 it fell to 0.8 times and 0.6 times. Ever since the note ban, the direct tax buoyancy has more than doubled from 0.6 times in FY16 to 1.3 times in FY17 and 1.7 times in FY18. The I-T Department detected undisclosed income worth Rs 35,460 crore since 2014. From April 2014 to December 2014, Rs 11,442 crore worth of undisclosed income has been identified by Income Tax department in search and survey operations while Rs 582 crore were seized by I-T officials. An amendment was made in the Income Tax Act in 2017 which made it easier for I-T officers to conduct a search and survey operation. They were not required to disclose their 'reason to believe' or 'reason to suspect' before conducting the raid. As a result of the amendment, total 12,526 surveys were conducted by the I-T Department in FY17, detecting Rs 13,736 crore. The number of surveys was mere 4,428 in FY16 detecting Rs 9,700 crore. PM Modi's promise to bring back black money may not have been fulfilled, but his policies have definitely made an impact. Measures like IDS and PMGKY instilled fear in the minds of unscrupulous businessmen, which resulted in the declaration of Rs 70,250 crore undeclared income. This income was taxed at upwards of 45 per cent, raising the government's revenue. Meanwhile, tax compliance has seen a definite boost under PM Modi. The government managed to widen its tax base causing an uptrend in the tax revenue estimates for the current years at Rs 22.71 lakh crore. While indirect tax collection reached Rs 7.35 lakh crore till November 30, 2017, the Income Tax Department detected undisclosed income worth Rs 13,376 crore. Amendments to Benami Act in 2016 saw provisional attachments involving Benami transactions worth Rs 4,100 crore. Demonetisation, however, attracted huge backlash from opposition as well as the Supreme Court. Its planning and execution were questioned. While the government expected most of the demonetised currency, which would be black money, would not be returned after the note ban, only 1.04 per cent or Rs 16,000 crore did not came back to the banks. Also, the RBI has not declared the actual cost of demonetisation on the Indian economy yet as they are are still being processed. The monetary impact of foreign policy measures like GAAR and DTAA are yet to be ascertained. Moreover, significant decline in illegal deposits by Indians in Swiss banks since the Modi government assumed power does not mean that we have stopped parking funds abroad, which begs the question of where are Indians hiding their black money now. 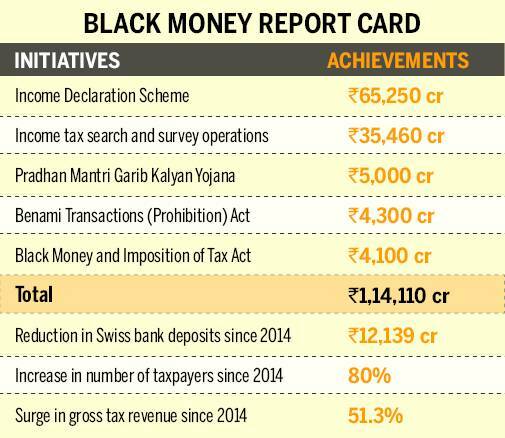 The Modi government has so far unlocked black money worth around Rs 1,14,110 crore. This includes money disclosed under the government's income disclosure scheme (Rs 74,350), benami transactions (Rs 4,300 crore) and income tax raids (Rs 35,460 crore). Also, a drop in money stashed by Indians in Swiss banks since 2014 is close to $1.77 billion (Rs 12,139 crore). However, the parallel black economy of India is estimated to be around half of India's current GDP of $2.60 trillion (in 2017). The big question is whether detection of Rs 1,14,110 crore as black money is enough.